The Dri Eaz LGR3500i dehumidifier is a recent addition to the range of Dri Eaz dehumidifiers and is in effect, the 2800i with 30% greater water extraction capacity. It shares all the impressive qualities of its close cousin but will be suitable for even larger scale restoration and other projects or will complete jobs of a similar size but do it more quickly. This is an extremely powerful unit which is claimed to have the highest water extraction rate of any portable dehumidifier in the market. Intended for similar applications, water damage restoration, structural drying and construction projects, the Dri Eaz LGR3500i does every bit as good a job but will do it on a larger scale, or faster. The increase in water extraction capacity is considerable, up from 130 to 170 pints per day at 80°F and 60% relative humidity, the AHAM standard. Restoration work is typically carried out in more extreme conditions of high temperature and even higher relative humidity and at 90°F and 90%RH this unit will pull an astonishing 240 pints per day from the air. This is definitely the machine for large restoration projects. It seems that no conditions are too demanding for this dehumidifier which has an operating temperature range of 33°F to 125°F. 125°F is hotter than most dehumidifiers can stand and this unit has little or no competition at that extreme. 33°F is about as low as it gets for any refrigerant dehumidifier due simply to the type of technology it employs. If it is necessary to operate at sub-freezing temperatures a desiccant dehumidifier is the only option. The impressive figure of 33°F is made possible by the hot-gas bypass defrost system which actively melts ice as it forms and enables the unit to continue effective operation despite the near freezing conditions. The Dri Eaz LGR3500i dehumidifier provides outstanding performance for two other reasons. The fan speed of the unit is managed automatically by the dehumidifier. Its sensors assess conditions of relative humidity and temperature and ensure that the fan speed is optimized to give maximum performance under current conditions, regulating the air flow as conditions change. The second reason is the use of Low Grain Refrigerant (LGR) technology. LGR technology enables a refrigerant dehumidifier to remove more moisture from the air at low specific humidity. Specific humidity, expressed in "grains of water per pound of air" is a measure of the absolute quantity of moisture within the air. This is different from relative humidity which is an measure of moisture in the air relative to saturation, expressed as a percentage. As the amount of moisture air can "hold" roughly doubles for every 20°F rise in temperature relative humidity can be lowered simply by heating a room. Specific humidity remains the same regardless of temperature and can only be changed by adding moisture to or removing moisture from the air. Conventional refrigerant dehumidifiers can only reduce specific humidity to a level of 55 to 60 grains per pound but with LGR technology a dehumidifier will continue to remove moisture to well below 40 grains per pound. Without going into too much detail this is achieved by pre-cooling the air before it passes over the condensation coils which causes more of the moisture to condense as the air passes over the coils. This feature provides two important benefits. First, it makes an LGR dehumidifier more energy efficient than a conventional refrigerant dehumidifier; second, it enables deep drying where this is required, particularly valuable for restoration and similar applications. The Dri Eaz LGR3500i dehumidifier is equipped for continuous drainage. Most dehumidifiers can offer this facility but it is usually by means of a gravity feed, which is not always convenient. For transferring condensate to an outlet some distance from the dehumidifier, or up to 20 feet above it, a condensate pump is incorporated in to the unit. The LGR3500i also comes with an automatic humidistat which enables a pre-set level of relative humidity to be achieved and subsequently maintained which can be important in some applications, particularly if the unit is left to operate unattended. 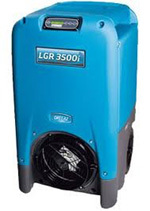 Like all Dri Eaz dehumidifiers the LGR3500i is a durable unit with robust working components, engineered to withstand heavy duty operation and frequent movement and enclosed in a tough roto-moulded polyethylene housing. The housing will protect the unit from most foreseeable conditions and comes with a life-time warranty. The housing is also kind to objects with which it may collide, such as a customer's furnishings. Naturally a unit as powerful as the Dri Eaz LGR3500i dehumidifier is relatively large but may be considered compact for a unit of its capabilities. The dehumidifier is equipped with an integral steel handle and robust wheels to ease movement on site. The LG 3500i is designed for restoration work so is portable and can be readily moved between locations on a small truck without fear of damage to the unit. The Dri Eaz LGR3500i incorporates sophisticated systems for monitoring and control, including a thermohygrometer which displays inlet and outlet conditions on the unit's digital control panel. As an accessory Dri Eaz offers the "HygroTrac Remote Monitoring System" with which a wide variety of information can be remotely monitored via the Dri Eaz secure Hygrotrac website. This system provides real-time data which can improve the management of projects, the deployment of personnel and equipment and improved cost-control.